Herbal Essences just launched their newest collection, Honey, I’m Strong, and what better what to get acquainted with their nourishing formula than to get a blowout using the collection with a celeb stylist? 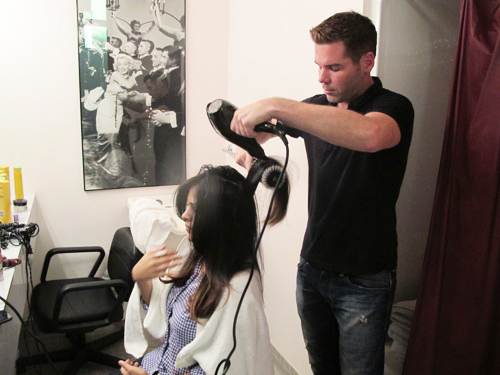 In this case, Charles Baker Strahan, who works with celebs like Leighton Meester, Brooklyn Decker, and Mariah Carey, took the reigns and tended to my locks. I felt specialll. Getting my hair done by Charles Baker Strahan! When we met yesterday, he told me about the benefits of the new strengthening formula — it coats each strand and repairs damaged areas of the hair (perfect if you’re a heat styling addict). 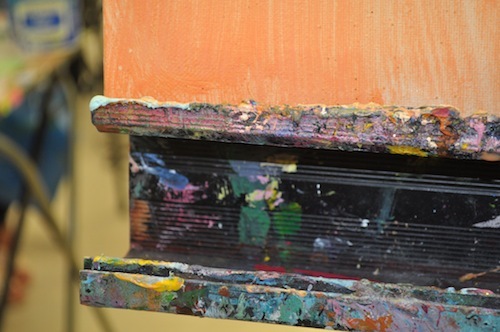 And of course, fills the room with a gorgeous scents of honey and apricot. With Charles after getting my hair done! As promised, my hair felt smooth, silky, and SHINY — not bad for shampoo and conditioner that costs $3 each. Herbal Essences Honey, I’m Strong line is available now at food, drug and mass market retailers nationwide. 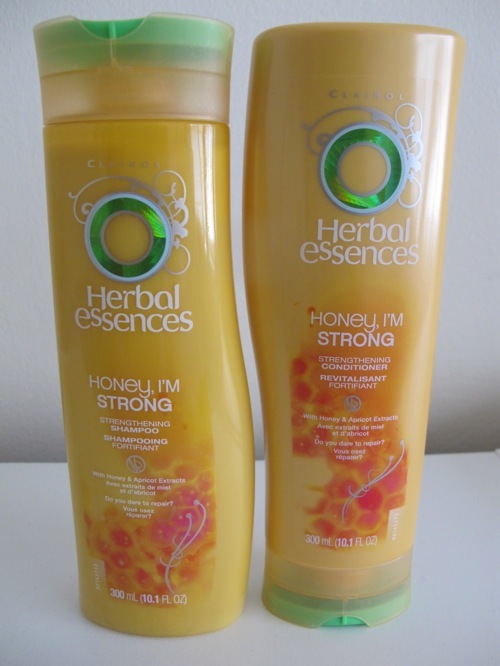 Do you have a favorite Herbal Essences product? If my blog were a person, I’d be giving her a good, long hug right now and tell her I’m sorry for neglecting her and, baby, it won’t happen again. Of course, she’d believe me and take me back (and I do promise to treat her better!). 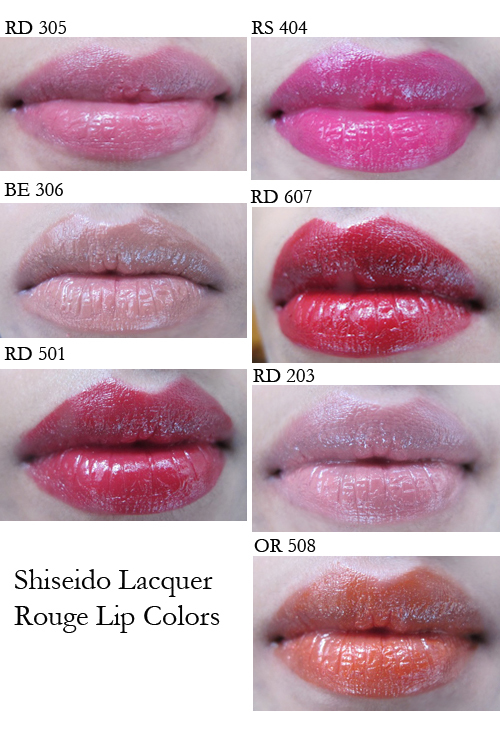 And now that all is OK, I have to tell you about these sumptuous Fall 2012 lip colors from Shiseido. In the wise words of Rihanna, Where have you been all my life? Which ones are your favorite? I think RS 404 (Disco) has my heart right now. 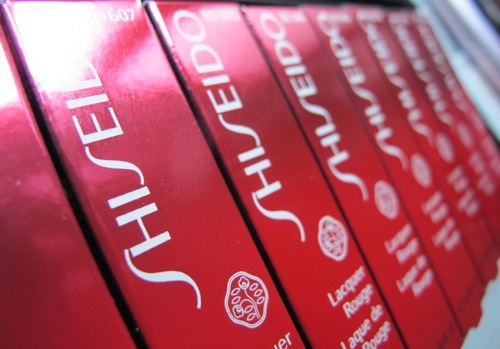 They cost $25 each, and are available online at shiseido.com. Eco-Manicure and pedicure at Om Aroma & Co. Admittedly, I’m not one to go too frequently to get my nails done. For one, I find staying at home and doing my own a bit therapeutic. Two, I’m so impatient, I can’t sit in one place for my nails to dry, so at least at home I can walk around and finish all my little tasks. But more important, I’m a stickler for sanitary and clean salons where are not always easy to find in the city. 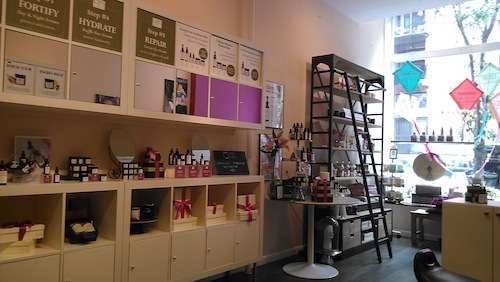 If you live uptown, I always recommend Polished Beauty Bar to my friends, but for downtown, I found a new urban oasis: Om Aroma & Co. in the West Village. Inside Om Aroma & Co. I was invited to get one of their Gorgeous Goddess Eco Mani/Pedi ($59.00) or else I might have never found this place to begin with (my friends flipped when I told them I’m getting my nails done for work research…but it’s true!). 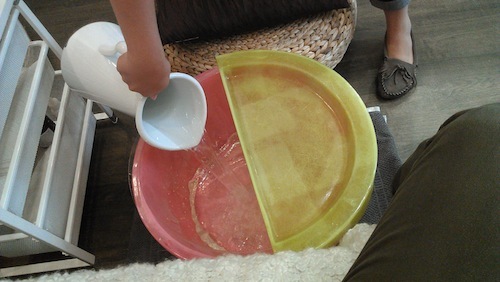 Pedicure Bowls with Plastic Liners – They only fresh water and our sanitary pedicure bowl liners so you know you arent dipping your toes into any dirty water! Plus, the liners for the bowls are both recycled and recyclable, so no waste. Organic Chardonnay Cream, Honey Scrubs, cuticle oil, etc. – they use all-natural products including their own organic scrub and cream and custom cuticle oil and alcohol-free hand sanitizer. Throughout the treatment, they used relaxing aromatherapy sprays. They also exclusively use the natural line, Zoya (I got my nails done in the gray “Dove” and chose hot pink “Ali” for my toes). And if you’re trying to pre-occupy your little girl while you get your own nails done, they offer kid mani/pedis (yes I know, I’ve been seeing this all the time nowadays). 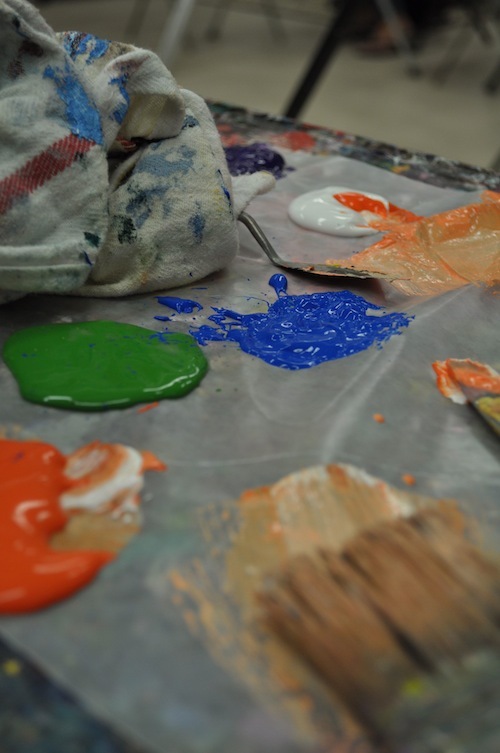 For kids, they use a water-based nontoxic polish called Hopscotch Kids. More than anything though, this place was relaxing. When I went on a Sunday afternoon, it was just me, my nail tech, Ivy, and one of their feel-good book of quotes they provide while I’m getting my nails done on their comfy couch with plush pillows — a non-traditional but welcomed way to de-stress! **DISCOUNT ALERT: From now through Labor Day, you can book your own mani and pedi ahead of time and receive 50% off of your first appointment! The offer is for Mani+Pedi combo only, but its a great deal considering you’re getting their usual $59 treatment for only $30! ** Tell them you heard it here first :). Model and actor Sasha Azevedo once said, “When you’re a beautiful person on the inside, nothing in the world can change that about you. Jealousy is the result of one’s lack of self-confidence, self-worth, and self-acceptance. The Lesson: If you can’t accept yourself, then certainly no one else will.” She’s right, of course, and acceptance of oneself is an easy concept, but obviously, a difficult practice. And we all know it’s challenging in terms of our physical appearances, to put it mildly. 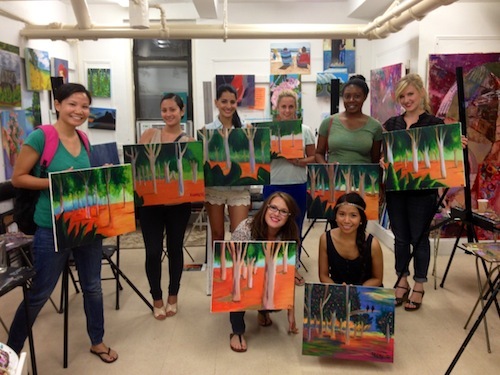 But who knew it’d be particularly tough at a painting class? 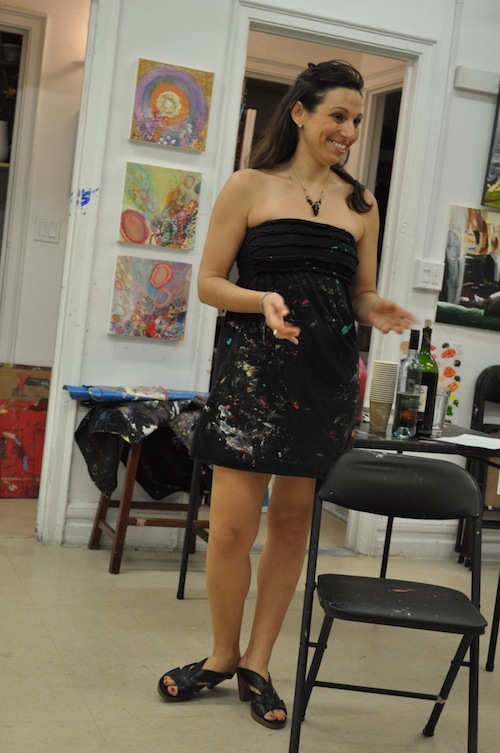 My sister Brooke and I (and a small group of lovely ladies) were delighted to join the beautiful Rebecca Schweiger at the Art Studio NY‘s 1-Nite Wine and Painting Party–hosted by Course Horse–in a small, paint-splattered art studio on the upper west side. 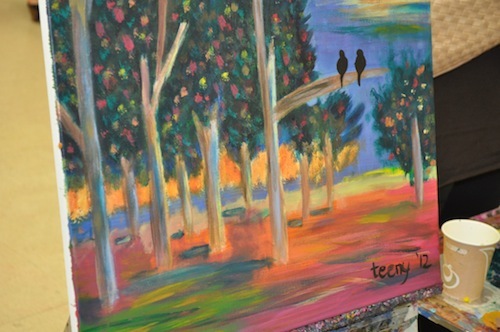 What commenced, then, was a blissful, almost-judgment free night of lots of validation, a little tipsiness, and pretty awesome renditions of our “inspiration piece”–the painting which we were to gain inspiration from. 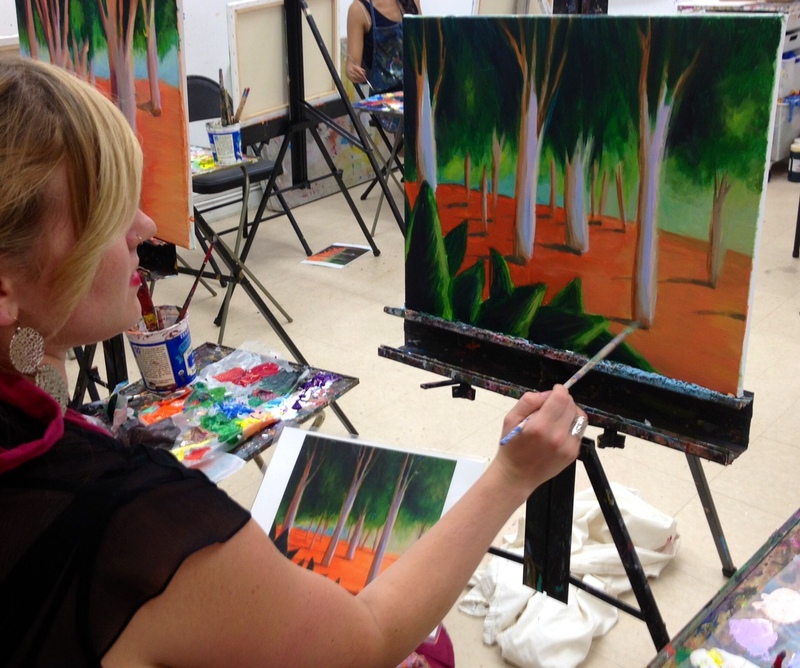 Everyone in the class did something almost entirely different–it was stunning. 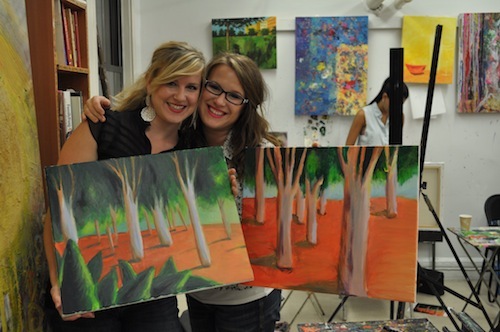 Me with my sister, Brooke and our paintings! Brooke and I left feeling almost high–we’d spent three and a half hours trusting our instincts, praising ourselves, laughing at some moments and being utterly serious about the work before us in others. It was a night we’ll remember forever, to be honest with you. 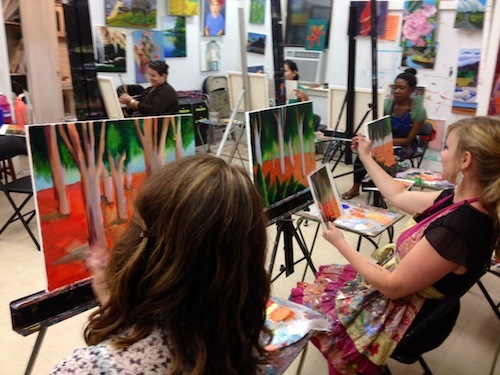 I couldn’t recommend the class highly enough–especially if someone you love joins you. My style is: Never too serious. The song I have on repeat right now is: Call Me Maybe by Carly Rae Jepsen – it’s def the summer anthem! 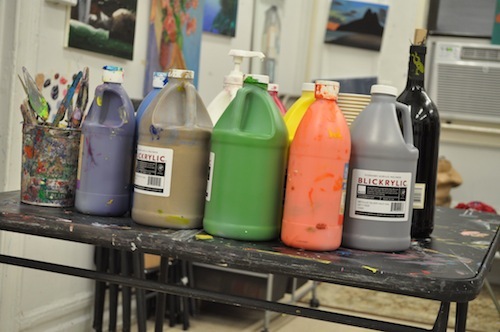 Growing up, I really wanted to be: a fashion designer! The best part about being a stylist is: I get to help women feel beautiful. Whether it’s a makeover or just sharing my latest beauty or fashion finds (lipstick, new skin cream, jeans that actually make you feel good etc…) I love getting feedback from friends, family and women I have yet to meet, who tell me that they feel confident and pretty because of something they learned from me. My best fashion advice: Have fun with it! 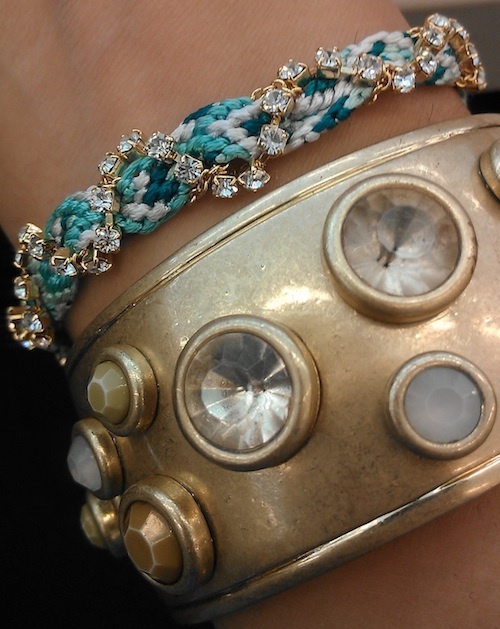 Mix patterns, pile on gold accessories (gold looks good with everything…) and wear COLOR! People usually compliment my: My eyelashes. People always ask me if I’m wearing fake lashes…but I never do. Thanks to my dad, I got freakishly long lashes. 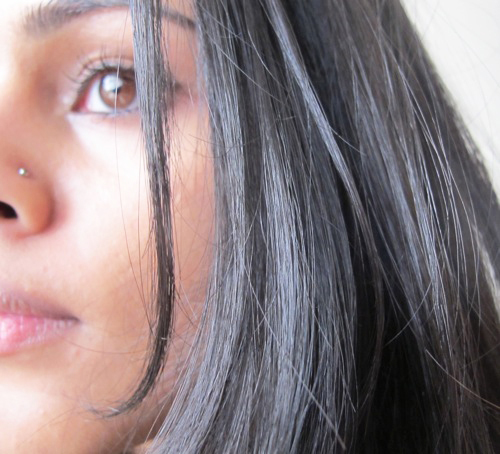 For my skin, I use: Josie Maran Argan Oil is my number one skin savior. Especially after long days shooting and wearing heavy makeup. I wear it every single night before I go to bed. It will change and heal your skin! My favorite place in the whole world is: Encinitas, CA. It’s a cool beach town where I grew up and where I spend my summers. People are relaxed and casual and it’s always a nice break from my crazy, fast-paced lifestyle! Current beauty product obsession: Stila Convertible Color in Gerbera. I literally put this on my cheeks one day (with my finger…it’s a cream blush that you can wear as lipstick too!) and my boyfriend and cousin both asked why I looked so amazing…this product is the answer! It’s perfect for summer and I am simply addicted. But I also can’t live without: my Vivier Skin Hexam IDS gentle face cleanser. It’s perfect for my sensitive skin. Worst habit: Biting my nails. I was forced to stop when I started going on TV because the camera would always get close up shots of my hands. I have to get regular manicures to keep from biting. I always get a pale pink color. Essie Mademoiselle and Essie Ballet Slippers are my two favorites! When I travel, I MUST have: a travel size Johnson’s Baby Shampoo (right from the drugstore!) I have been using this to remove my eye-makeup since I was a teenager. It’s as gentle to your eyes as pure water and removes stubborn eye makeup like nothing else. My favorite scent right now: I have been using Henri Bendel Vanilla Flower forever. When I found out it was going to be discontinued, I bought out all the lotions and perfumes I could from the store (panic mode!) It’s been my “signature scent” for a very long time. I also like Jo Malone Pomegranate Noir. People might be surprised to know that: I am crazy competitive when it comes to sports. I have to win. My current favorite hair product is: Philip B White Truffle Nourishing & Conditioning Creme. I leave it on for 5 minutes in the shower and my hair feels like silk. I don’t understand people who don’t like: Sushi. I could eat it every single night (especially at Izaka-ya in LA). The restaurant I can never get tired of is: Borrelli’s Pizza in my hometown. I was a hostess there in high school (my very first job, ever) A tiny, inexpensive, family fun business in a strip mall. Nothing fancy, but the mostaccioli will change your life. And it’s less than $10. Though I can make a mean: “Grasshopper” juice using my Hurom juicer. A mix of pear, apple, pineapple, mint and wheat-grass. Healthy and so delish! I hope in 5 years: I will still be healthy, happy and doing what I love. Who inspires me: My friends and family inspire me everyday. I also get great inspiration from one of my favorite blogs I Wanna Be Gwyneth. Do ANY of you remember those friendship necklaces? There were two necklaces, and one pendant was half a heart that said “BEST” and the other necklace’s said “FRIENDS” and you would wear one while your bestie wore the other? (No? No one? Was I the only one who got super excited over these things?). The problem was I never knew which friend to give my other half to #teenagerproblems. Anyway. All that to say when I came home last night, I found this beautiful Ettika bracelet on my bed left for me by my friendsin Safia (that’s cousin/friend mushed together, natch…thought it sounded better than “co-friend”), and it reminded me of those times. I kinda love this. A much more grown-up version of cuteness. PS This pic was taken by the new Droid Incredible HTC 4G LTE that I’m testing out — what you think? ?